New, FREE report reveals the name of a safe monthly dividend stock that you can hold forever and leave for your grandchildren. The company pays a dividend EVERY month and a bonus dividend twice a year - December and June. 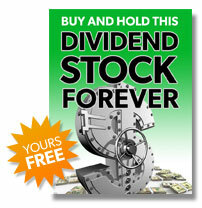 Buy the stock by December 14 to collect your bonus dividend in addition to the monthly dividend paycheck for December. There is simply no other stock that can be counted on to pay you 14 dividends per year and provide a growing, safe cash income stream. "I am a satisfied customer of yours, having finally found an advisor who reflects my view on investing for income. I'm 66 so income is my primary goal but I want stable vehicles as well. I am using many of your recommendations and some tax free positions to fund my retirement. Thank you!" "Since joining you in late 2016, we have done well with your recommendations. Our yearly dividends are currently $39,000+ and with a few covered call options, is it well over $40k. With this much extra income, life is good. (We are leaving on a 10 day Caribbean cruise today!)" This is a free service from Investors Alley. No credit card is required nor is there any obligation. The information in this email and corresponding websites are neither an offer nor a recommendation to buy or sell any security, options on equities, or cryptocurrency. Investors Alley Corp. is neither a registered investment adviser nor a broker-dealer and does not provide customized or personalized recommendations. Past performance is not necessarily indicative of future results. No trading strategy is risk free. Trading and investing involve substantial risk, and you may lose the entire amount of your principal investment or more. You should trade or invest only "risk capital" - money you can afford to lose. We urge you to conduct your own research and contact your personal financial adviser before making any investment decision. © 2018 Investors Alley Corp. All rights reserved. | More information.